With social media, Williams engages in conversations with current and prospective students, faculty, and staff, as well as alumni, families, colleagues, fans, and friends, strengthening connections and extending the community found on the Williams campus to the world. A glimpse at the Williams Social Wall. In addition to maintaining the college’s official social media presence, we provide advice and consultation to college departments, faculty and staff; hold training sessions that cover the basics as well as more specific platforms; and maintain a content schedule that tells the Williams story from different perspectives. Wondering how to use Snapchat? Want to design a content strategy for your Facebook presence? Want to use Twitter to promote your research, but don’t know where to start? We’d love to help. Contact Shannon O’Brien, the college’s social media strategist. If you’re on campus and thinking about developing a social media presence for your office or department, take a look at the college’s social media guidelines to get an idea of where to begin. Check out the college’s social wall to see what is happening around campus and in the community. Athletic news and events can be found on Facebook at Williams College Athletics and on Twitter @EphSports. For alumni news and events, follow Eph Alum on Facebook, @EphTweets on Twitter and EphAlum on Instagram. 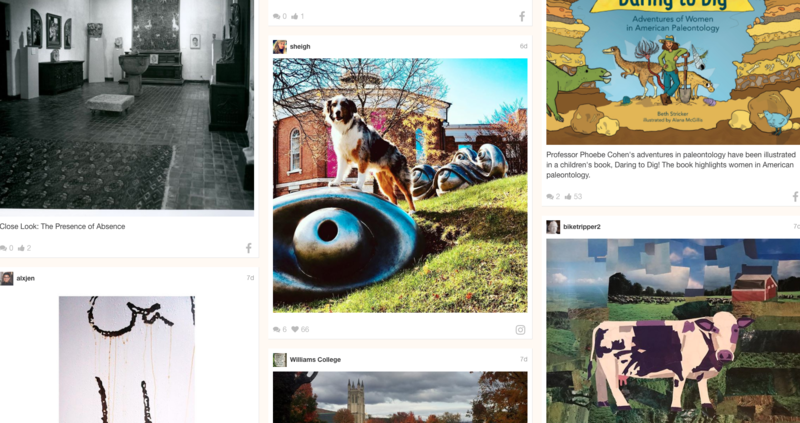 Follow events and activities at the Williams College Museum of Art on Facebook, Instagram and Twitter. Williams-Mystic Maritime Studies Program shares events and stories on Facebook, Instagram and Twitter.